I got my hands on a nice new server (20x 3GBZ ivy Bridge v2 cores) and managed to connect to some nice Violin Memory Flash capacity. With nearly no tuning I kicked off some workload and was quite pleased with the results. 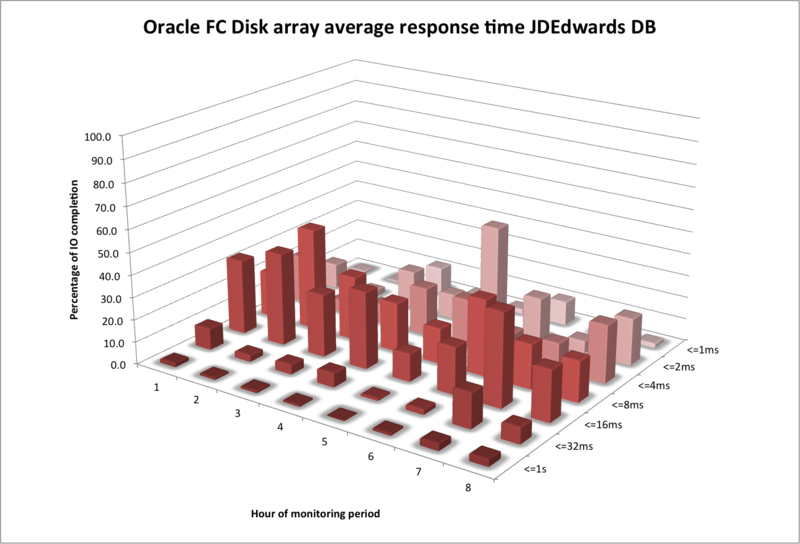 Some of the best vdbench results I have seen for FC connected persistent storage, from a single dual socket server, or from a 6.x linux. The best thing about flash memory is that it has no moving parts. Data is stored as independent bits of data, which are unrelated to each other. The size of application IO is immaterial, it will simply translate into multiple read or writes at the flash layer. The total available performance is really limited by the time it takes to read or write to a page and the number of pages available to read and write from. It should be possible to Read or Write to the system at a set rate of bandwidth regardless of the size of the application IO, assuming multiple parallel processes are in operation – I don’t just have a single threaded workload. This has a fantastic performance advantage, compared to disk, in that it does not matter if data is accessed randomly or sequentially with large IO’s or small. One thing I really like about the Violin systems is the ability to drive consistent bandwidth regardless of IO size. This means that the workloads that drive small transfers of a random nature are less likely to cause noticeable impact to other workloads on the same storage, and makes our arrays ideally suited to mixed workloads. This means many threads of work, each potentially doing a different or varying average IO size. I have recently seen a number of vendor marketing claims that suggest you should not be interested in how many small transfers you can do, only the number of average sized IOs your system can do. This is funny because disk arrays are good at doing average size IOs. So if the software on top of a flash array does not let you drive full bandwidth at a small IO size, then you are missing the point of flash. But some vendors seem to quote only one optimal block size, claiming that this is optimal for a certain type of application – 32K is often chosen as an average IO size. This is ok, and relevant for some applications, but certainly not all. Also being an average it will probably be an average of some large IOs and many small IOs. You need to ensure there is no bottleneck in the hardware or software that stops you going above a limited rate of IOPS regardless of block size. You need to look for a flash array where the number of IOPS it can sustain nearly doubles as the IO size halves. Or delivers the same high rates of bandwidth regardless of IO size. Flash is being used to replace disks, but the marketing message can often obscure the deeper benefits that flash offers. 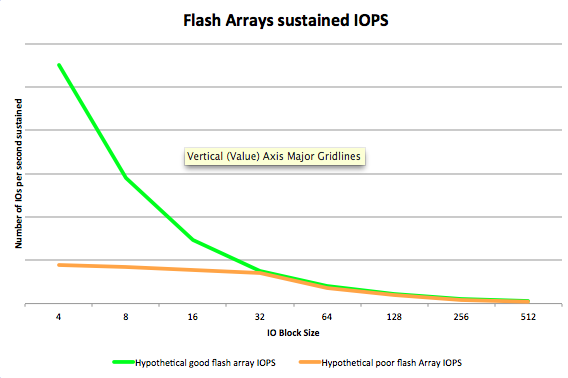 All IOPs are not equal – they just should be! * Please note that both graphs deliberately have no scale, and should be viewed as purely hypothetical and make no claims. Following the full release of Violin’s WFA product, I can now share some of my understanding gained from using it over the last six months or so. 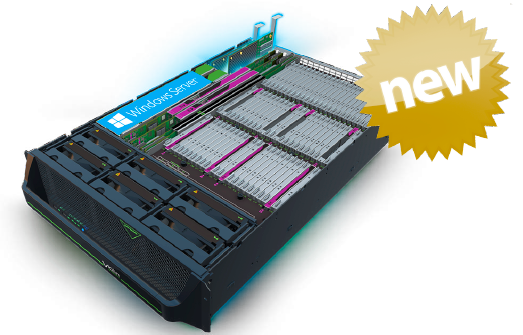 Violin’s WFA – “Windows Flash Array”- is a storage system that embeds a specially optimised version of Windows 2012 R2 on our gateway modules and provides very fast performance to SQL, Hyper-V and other application environments over SMB3. For more details see HERE, or for Microsofts view you can review the TechNet blog here. This is the first of a number of blog entries to provide some further technical detail on the product and the benefits it provides. While it is essentially a simple premise and a product that is very easy to use and manage, it has taken me a while to get my head around the new vocabulary associated with using the latest version of SMB3. SMB Direct, iWARP, RoCE, SMB-Multichannel are all technologies and acronyms that combine to deliver the biggest benefits to SMB3 over previous versions of the protocol. What are those benefits I hear you ask? In short they fall into two areas: performance and availability. Performance: with the improvements in the protocol, we can now drive very high bandwidth and very low latency from a modest Windows server only using a small amount of CPU resource. I have done my own testing and can confirm that the latencies are significantly lower then FC to the same array for nearly every IO profile…. For full details of the performance numbers please contact your Violin representative. Why is it faster? The simple answer is RDMA. Microsoft have added the capability to perform data transfers via “Remote Direct Memory Access” to SMB3 and named it SMB Direct. In my simple understanding, RDMA allows one system to perform a data copy by directly reading or writing from the memory of another computer, avoiding many levels of protocol overhead. There are two competing implementations that are both supported by SMB Direct; iWARP and RoCE and interfaces either support one or the other. The other nice thing about SMB-Direct is that it requires no setup, if the environment supports SMB-Direct it just works. The easiest way to tell if it’s working is by looking at the SMB-Direct counters in perfmon, or using the powershell “commandlet” Get-SmbMultichannelConnection. Availability: Microsoft have added a new capability in to the SMB protocol called SMB-Multichannel. This automatically detects and utilises all available paths to an SMB share that are running at the fastest speed. It is like MPIO or Ethernet link bonding, but requires no manual setup or additional software and provides very fast failover and failback. Failover between cluster nodes on the Violin WFA are pretty much undetectable to a client server; even when physically pulling a network link on a client under very heavy load IO continues with little interruption. The below example is created by saturating 4 links on a client before pulling one link, then reinserting it 30 seconds later. Historically I have been reluctant to recommend file based shared storage solutions for applications or databases that require the lowest latency and the highest reliability. However, with SMB3 and SMBDirect we get higher bandwidth and lower latency storage connectivity with automatic resiliency. 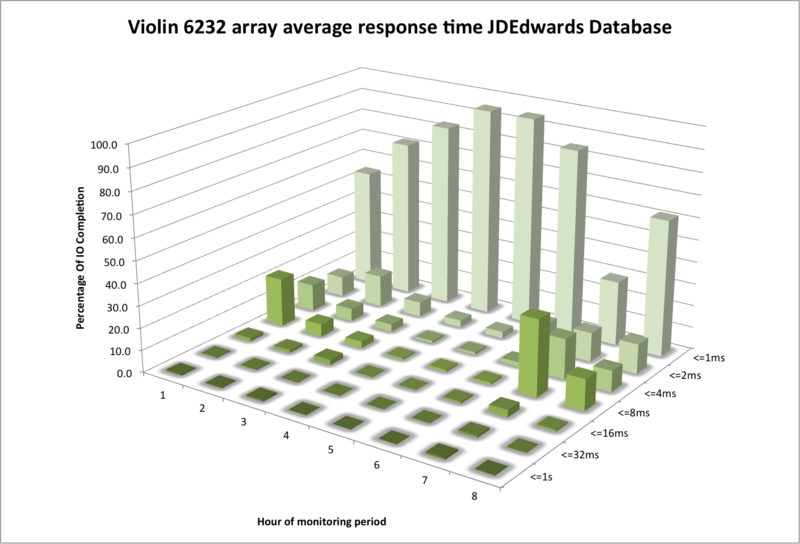 When combined with the Violin 6000 array as WFA you get a very high performance solution that is very easy to manage. One of my esteemed Oracle colleagues recently discovered a problem accessing his data after upgrading a system with Yum to 6u5. He was upgrading to get the newer UEK kernel but he also ended up with a newer Brocade HBA driver. It took a while to spot the problem because there are no obvious errors but it seems that the default behavior of the Brocade HBAs had changed. I think this is specific to “direct connect” storage connections (ones with no switch between server and storage ports). On the older version all was working well with the storage FC ports set to “Point to Point” only and the adapters set as default (also point to point). After switching the upgrade to get a functional environment we had to switch the storage array ports to “Loop preferred” the host and storage then successfully negotiated a “Point to Point” communication. The only indication of the problem was the below entrys from the messages file. Do I still need to tune storage in Linux? Here at Violin we have a number of best practice recommendations for all types of OS and databases. Some customers follow all of them, whilst others require persuading. One recommendation that can sometimes cause debate is utilizing the UDEV rules to optimize the IO schedulers in Linux. Sometimes this can make a dramatic difference, other times very little. A colleague of mine has recently been investigating slightly unpredictable performance on a VM running RHEL compared to SLES. It turns out that the UDEV recommendations had not been applied to either. It seems that the defaults in SLES 11 are better optimized by default for high performance in Virtual Machines. Both VMs in the above example are deliberately limited to a single vCPU and hit limits of guest CPU before stretching the storage. But in this situation we saw up to a 15% improvement on SLES and 30% improvement on RHEL. So different flavours have different benefits, but even at these modest rates of performance there is a significant benefit in both bandwidth and latency. To get the recommended best practices for your environment just ask your Violin contact. I often get involved in sizing Violin arrays for particular requirements. We get requirements that are written in many different ways, some make sense and others don’t. “1 Million IOPS” is maybe the most frustrating request I hear. We have the three traditional metrics, IOPS, bandwidth and Latency. They are all closely related. Bandwidth really is just a measure of how many IOPS and at what IO size. IOPS are limited by how many operations your application submits in parallel and how long it takes your storage to respond. Latency is a measure of how long it takes. FlashDBA has put his every thought on these metrics here. So the most interesting number to look at is latency, but when to measure the latency? 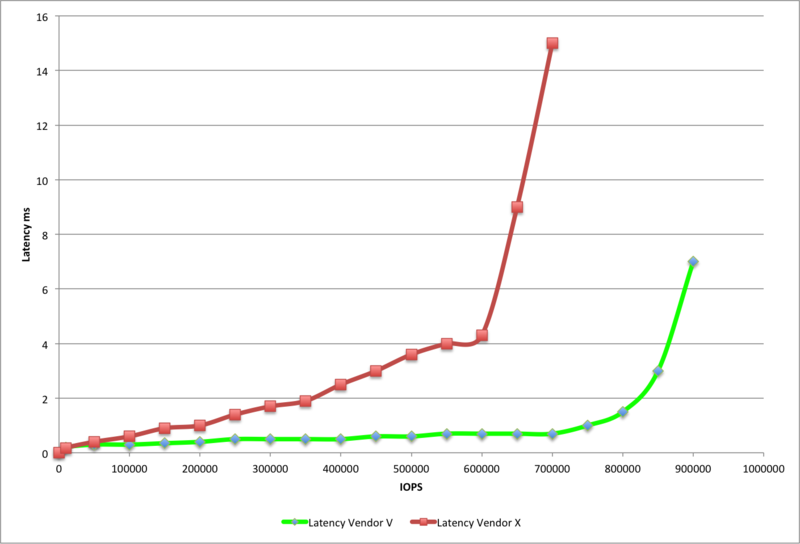 If you consider the above graph, the two systems being measured have similar minimum latency and both scale to good rates of IOPS. However, the area in the middle will result in very different application performance between the two systems! It can result in a factor of ten in application performance. As these differences between different systems are now better known, we are getting less requests for minimum latency numbers and maximum IOPS rates. We are increasingly being asked excellent questions like what latency will we see if I do this many iops? What size are these IOs on average? On flash a single 16k write takes as much backend work as four 4k writes. Are the IOs random or sequential? Random operations work better on some systems than others. How much capacity will these IOs be spread over? That is the active working set size, not just the total usable capacity required. What is the read / write mix of the IOs? 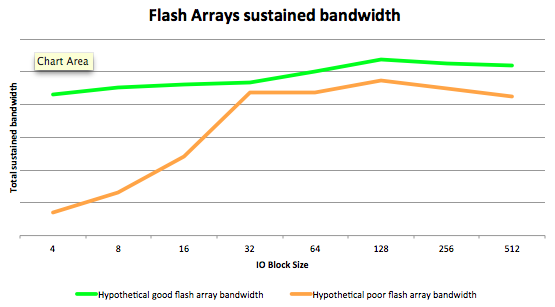 Flash can perform very differently for a 90% write workload compared to a 10% write workload. How many hours a day does this rate of IOPS and bandwidth need to be sustained? Background operations can kick in after several hours of operation. What protocol will be used to connect the server (s) to the storage? They have different limits and different latencies. Is de-duplication planned to be switched on? How cryptographically unique is the working data set? Why do you ask this? Because if a test harness constantly sends similar data content as read and write requests to an array, the data will be permanently embedded in DRAM cache, in fact no IO request will ever reach flash. This gives an artificially high IOPS and artificially low latency measurement, that will never be achieved with real data. We are finding that customers ask a selection of vendors questions like, how many random 8k IOPS can I achieve at less than 0.5ms response time 50/50 read/write spread over 10TB of usable capacity? Often we find we are the only vendor able to provide accurate results to such requests. So what is the best way to confirm a system is fit for your requirement? Be wary of IOMeter or FIO or VDbench type demonstrations, there are so many parameters, they can be adjusted to show nearly anything and are probably not relevant to you. I would look for results of running your database or application with your dataset size or bigger for days or weeks on end. Some published results like VMMark or Oracle benchmarks are good for this. Best still is to find a reference customer with a similar environment to yours. Ask that existing customer what happens to performance when a module breaks…….but that’s a subject for another blog entry. Pretty graphs often help visualise how things have changed the below is after a live move of some misaligned luns from an FC array to Violin. Now we need to align the IO and see if we can reduce further the higher latencies for the bigger blocksizes. In my role I often see things that are new to me and impress, surprise or frustrate me. The purpose of this blog is to simply provide a place to quickly document items that may be useful to myself or others in the future. The statements and opinions expressed here are my own and do not necessarily represent those of my employer Kaminario. Neither Kaminario nor I makes any representation or warranties about the accuracy or reliability of this blog. Technical content has not been checked and may contain mistakes, typographic errors or inaccuracies. Note on partition alignment on Linux.